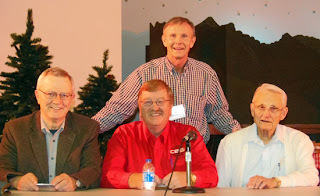 It was a trip down memory lane on Tuesday, October 9, 2012, when three veteran broadcasters reminisced about the early days of radio and television across the Black Hills. That was the subject of the October gathering of the Spearfish Area Historical Society, which convened at the High Plains Western Heritage Center in Spearfish. Highlighted by long-time broadcaster Verne Sheppard -- who is something of an institution in Rapid City and across the hills -- the group also included popular regional personality Jim Thompson, whose broadcasts are still heard across the Black Hills and in surrounding areas. Another retired broadcaster, Larry Miller, spent most of his career in other parts of the country but now resides in Spearfish. The comments of the three broadcasters were preceded by a 20-minute video piece assembled by Miller that included segments about the history of radio stations KOTA and KRSD in Rapid City, KDSJ in Deadwood, KBHB in Sturgis, and KBFS in Belle Fourche. Early television operations at KOTA and KRSD were also included in the piece. It also contained interviews with current and retired broadcasters, including Dana Caldwell, Al Decker, Marguerite Kleven, and Karl Grimmelmann, among others. About 75 people listened as Verne Sheppard recounted his many roles in broadcasting over the years, and as he recalled many of his colleagues at KOTA who have moved to other parts of the country or have passed away. Folks like "Captain Glenn" Rowell, Al MacDonald, Polly Weedman, Harley Hansen, and others. With a razor-sharp memory, Sheppard recalled his early career in Wisconsin and Minnesota, and shared an anecdote about commiserating with a colleague in the Twin Cities who had been let go from his job at the station. Not to worry -- the man went on to a successful career in broadcasting. His name was Harry Reasoner. While that's not a household name today, for anyone in America who watched television in the 1960', '70's, and '80's, Reasoner was at the top of his game with both CBS News and ABC News. Thompson used the occasion to help give audience members a better understanding of broadcasting, providing a primer on why some station call letters start with a K and others begin with W. Miller and Sheppard chimed in with examples of station call letters that relate to the station owner, such as WGN (World's Greatest Newspaper) in Chicago, WOW (Woodmen of the World) in Omaha, and KMA (Earl May Garden Centers) in Shenandoah, Iowa, among others. There was considerable discussion about how rapidly the broadcasting industry has evolved -- from days when wire recorders were the cutting edge of recording audio, to the present day when technology puts high quality devices into the hands of almost every individual. Miller noted that even consumer-type video cameras today offer a quality that surpasses the quality of video cameras used in commercial broadcasting just 25 years ago. And instead of costing $40,000, they can be purchased for a few hundred dollars. You'll find a photo or two from this and other programs presented by the Spearfish Area Historical Society in our Spearfish Gallery.